It certifies that the wheels meet the requirements requested by the Product Specifications. Therefore the “Denominazione di Origine Protetta”, equivalent of PDO, is authentic. Without this mark, the cheese can neither be named nor be sold as Grana Padano, not even when grated or cut into portions. The “GRANA PADANO” brand was created by the Grana Padano Protection Consortium. It is registered with the Bureau International pour la Protection de la Propriété Industrielle of Bern. The brand is also registered in Italy and in many of the most important countries in the world. 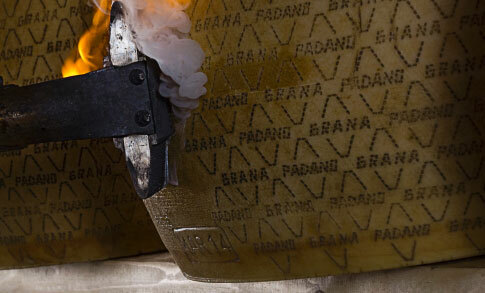 The unique marks are fire-branded by the technicians of the Grana Padano Protection Consortium.